What's the height of the square tower on the first render of post 4? Does it have a thread? I, for one, welcome our new Westside giants. This in is looking real good, nice glass facade and yet a contrast with the also-nice glass tower next door. This shows how much there's a need for better subway access to the area. All of those developments have their own threads. And there's also the MSG and Penn Station redevelopment to the east. This cluster will be a sight to behold. The ESB will be almost lost from view from the Jersey side. Yeah, there will be a steady stream of giant towers from the ESB all the way to the Hudson. We need something taller on the eastside to balance it out some. The Con Ed site should have been much more than it is. True. This tower sits over what will be the final stop on the 7 train. My only concern (a small one) is that what happened with Downtown Brooklyn development doesn't happen here. There was a similar rezoning to create commercial development there, but it has been overtaken with residential developments. 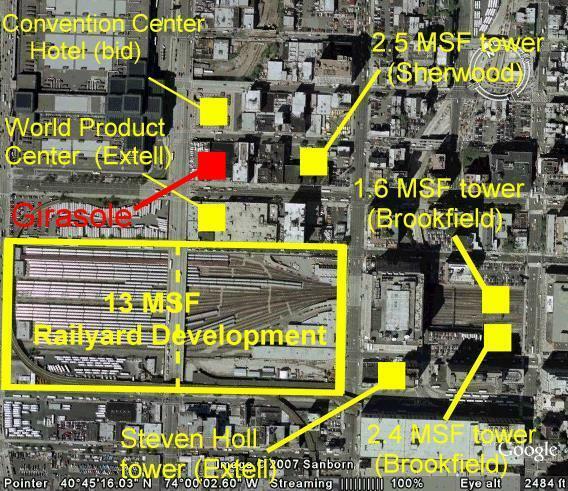 We know that Sherwood hasn't decided between office or hotel on its massive 2.5 msf tower. This area was rezoned specifically to be Manhattan's 3rd business district. 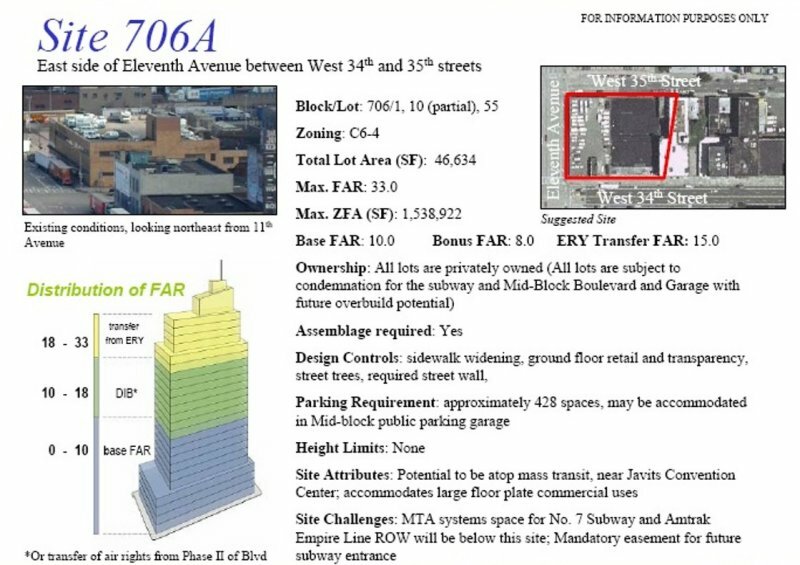 I just hope the bulk of what's been rezoned north of 34th Street for office towers doesn't get eaten by residentials. Wow. Just when I thought the westside was going to be a repeat of midtown-east, the Girasol design is released. Situated in the heart of Manhattans newest neighborhood, the dynamic Hudson Yards District, 3 Hudson Boulevard, "The GiraSole" will be a gateway for the West Side and an icon of green architecture for the 21st Century. From its sky gardens to the reaches of the new Hudson Boulevard Park, this new 1.6 million square foot tower will be surrounded by green. Soaring to a height of over a thousand feet, it will offer unparalleled views south and west over Hudson River Park, the High Line and the new park and development of the Hudson Rail Yards. August 1, 2007 -- THE former Copacabana site at the southeast corner of 34th Street and Eleventh Avenue is morphing into an approximately 1.5 million-square-foot skyscraper that could become the home of the World Product Centre, a showroom that will feature the latest in high-tech medical equipment. WPC is the brainchild of Israel Green, who has just signed a letter of intent with Gary Barnett for a "full 1 million square feet," which will be about 70 percent of this new Extell Development project. The 45- to 50-story building is being designed by Kohn Pedersen Fox with WPC innards by FXFowle Architects. Just a sign of things to come. Whether you like the design or not it significant in that it shows that NYC will be a participant in building supertall bldgs. It may take a while, but, given the demand for commercial space and the aging commercial office bldg infrastructure, NYC will remain very relevant when it comes to supertall construction. Whether you like the design or not it significant in that it shows that NYC will be a participant in building supertall bldgs. Right. Given the fact that just a few short years ago, people were writing off tall skyscraper construction in the city (in the aftermath of 9/11), it's really impressive. It's as if the floodgates have opened, as the bulk of skyscraper developments on the west side now include 1,000 footers. It will be really interesting to see who pushes away from the crowd, creating the dominant tower in the area. wonderful supertall , please start it as soon as possible!! 50 stories and 1000'???? seems like that crown is a bit bigger than depicted. As we know, stories don't translate into height. The GiraSole Coming to Hudson Yards? Our public demanded it, so here it is. In yesterday's Linkage, someone commented that we should cover the GiraSole (and then called us "hoes"). The GiraSole? Ah yes, the GiraSole! Visitors to the Javits Center may have notice a huge walled-off pit across the street, with Moinian Group signage all over it. 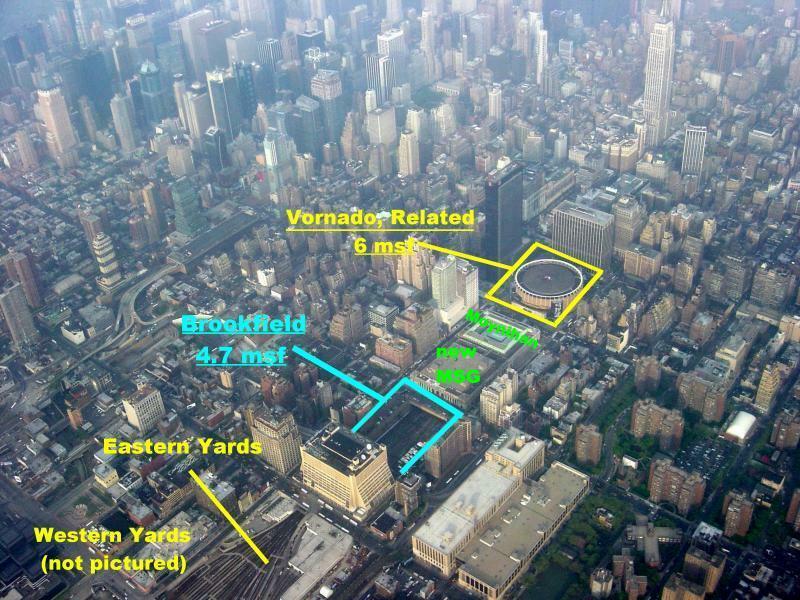 The plot will be the latest in a group of new high-rises surrounding, and occupying, the Hudson Yards. The above, as pointed out by the eagle-eyed SkyscraperPage forum users, is what architecture firm FXFOWLE suggests occupy that pit, at 555 West 34th Street. But if this mixed-use monster gets built, don't expect the view to remain the same as the above rendering. First, the facts on the building. According to FXFOWLE, the GiraSole will be completed in 2011. The thousand-foot office/condo tower will also be green as hell, with "sky gardens" and a solar power-generating crown. LEED Platinum certification is also on tap. Pretty exciting stuff, but can it steal the spotlight from its various upcoming neighbors. A SkyscraperPage member put together this graphic, showing all the new gigantic developments in the immediate area, including architect Steven Holl's Towering S.
There can never be enough PAX, 'wichcraft, Cafe Metro and Pronto Pizza locations to cater to this influx of office drones. That 7 Train stop sure is going to be a party, though. wow. how many 1,000+ do we have proposed/under construction now in the city? anyone know? A lot of them are proposed, its hard to keep track of them. But only one real 1000 footer is U/C. Nothing's set in stone. I checked the DOB website and couldn't find anything. But they're already excavating the site. And I've sporadically checked the Fox and Fowle website for almost a decade now and they don't post fantasy projects. What's really surprising to me is that Extell is starting work on a tall tower as is Moinian. Has the 7 line even started construction yet? Right now there is no middle ground, theres these construction sites and then gas-stations, chop shops, junk shops, mcdonalds, clubs, and parking lots.